(Newser) – The ship bound for Rome sunk in 1BC and was first discovered off the coast of Greece in 1900. And yet the Antikythera shipwreck is still providing new discoveries. The Guardian reports an expedition to the site last month turned up a silver tankard, a human bone, and much more. Perhaps most exciting: the arm of a bronze statue and evidence that the remains of at least seven bronze statues are still buried there. 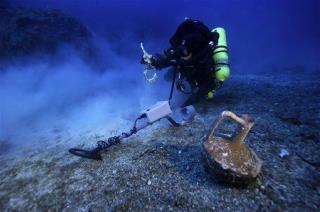 Previous bronze statues found at the Antikythera shipwreck were dated to the 4th century BC. Bronze statues from that time period are extremely rare, with only about 50 known in the world, according to Gizmodo. National Geographic reports that based on the positioning of the fingers, the newly discovered arm may belong to a statue modeled on a philosopher. what an exciting find. I hope they can recover something else like the Antikythera Mechanism, that thing is mind boggling. The disk with a bull engraved on it. I'm thinking it's a Bronze Age Howard Wallowitz's belt buckle. After all, this was obviously a ship of nerds, what with the high tech computer onboard and all.